A movement to ban public sector bargaining nationally, Wisconsin and Ohio are recent examples, is gaining more attention. The promoters, including the Mackinac Center, justify this by submitting that joining a union is not a right but a privilege, like driving a car. 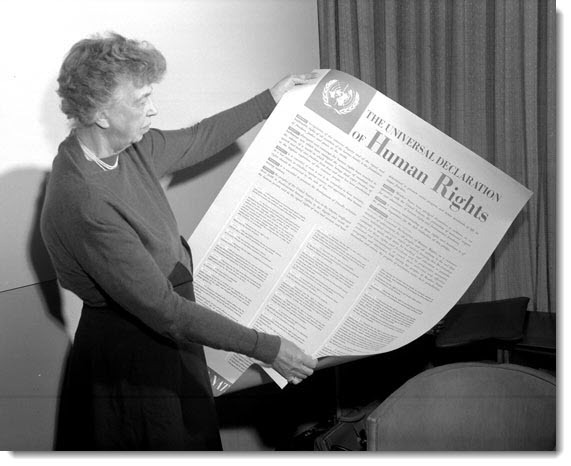 The United Nations was founded in the final days of World War II to avoid preventable wars and to “reaffirm faith in fundamental human rights.” In its early days, it formed The Commission on Human Rights, chaired by Eleanor Roosevelt. The Commission’s first act was to enact The Universal Declaration of Human Rights (UDHR), which was adopted by the General Assembly in Paris on December 10, 1948, and has since established a standard under which all governments are judged. When adopted by the General Assembly, there were no dissenting votes, although the six communist countries, then members of the UN, as well as Saudi Arabia and South Africa, abstained. Security Council resolutions adopted afterward routinely refer to violations of the UDHR. Burma, Argentina, China and the former Yugoslavia have all defended themselves against allegations that they violated human rights by claiming to uphold the UDHR. Republicans regularly point to the UDHR when criticizing other, usually communist governments. The Heritage Foundation used the 63rd anniversary of the UDHR in 2011 to argue that although “noble in its original intentions” it was under threat by Muslims and abortionists. Then-Republican presidential candidate Newt Gingrich’s well-known 2011 comment that Palestinian people were an “invented” people was made at a conference marking that anniversary of the UDHR. The message here is that the UDHR must be respected. At least when it dovetails with conservative policy. When it doesn’t, it is to be ignored. The UDHR establishes collective bargaining as a human right. You can’t responsibly use it as a weapon while pretending it doesn’t say what it says. Either the UDHR lists rights governments must respect or it doesn’t.